Hello everyone! I'm finally getting back into my blogging game and have been visiting everyone's blog and have slowly started catching up. So sorry for not responding to comments in a while. Life has been non-stop busy, and I can't wait to share what I've been up to! For now, I'm still catching up on long overdue posts reviewing items that have been sent my way. So today I'm reviewing two brands in one post: K-Lens Pop and Twinkle Deals (I know, aren't they the cutest names?). First up, the Bunny Color Brown contacts from K-Lens! Since these were sent from the same company that sponsored the violet lenses I reviewed HERE, I'd have to say they're exactly the same except for the color. In fact, I was amused to find that they match my natural eye color perfectly. So all these did for me was enlarge the appearance of my eyes. In the end, it adds a slightly more feral appearance to my gaze, which is only noticeable if you look extremely close. Below, a comparison photo of one eye normal and one with the contact in. Can you even tell which is which!? Time to get on to the Twinkle Deals portion of this review. In case you hadn't noticed, there's this gorgeous, shoulderless top I'm wearing that's from this company. Man, it is stunning and I am extremely happy to add it to my closet! I ordered it in XL because I'm built like a man and have the shoulders of one. It has an elastic lining at the top, thankfully, so that wasn't an issue. The sleeves are absolutely gorgeous, with flared bell bottom styled ends that are perfect for playing with in the breeze. It comes with a silky lining underneath that does a decent job at preventing complete transparency. So break out your bandeaus and join the shoulderless trend, ladies! I think it's a wonderful look that perfectly complements summer. 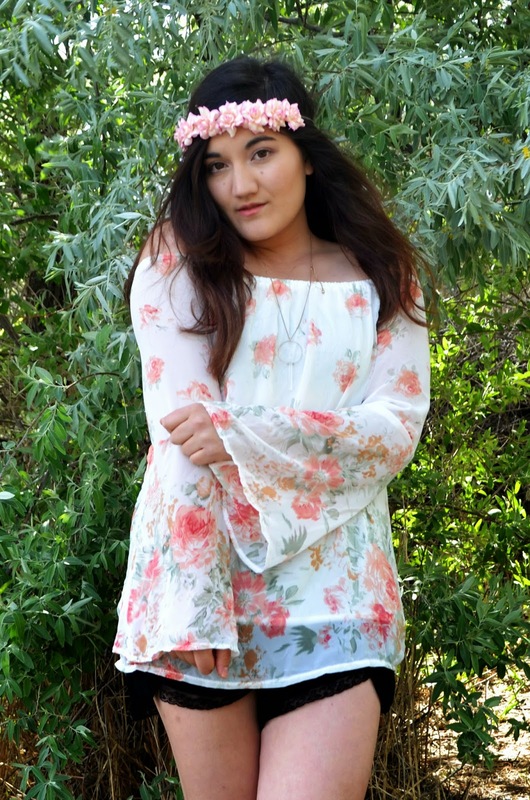 Paired with floral crowns and lacy shorts, I'm feeling more summery already. So to catch you up with why I've been AWOL (besides scheduling posts that have been going up in my absence), this past week has been spent: packing up and moving, visiting family, driving over 400 miles to visit a close friend, running my first 5K (more on that later), and trying to find a job. Anyway, I'm hoping to settle down into a semi-stable routine soon, and that will include blogging and visiting all of your blogs! What is your opinion on colored contacts? The shoulderless trend? Aren't you just stunning! 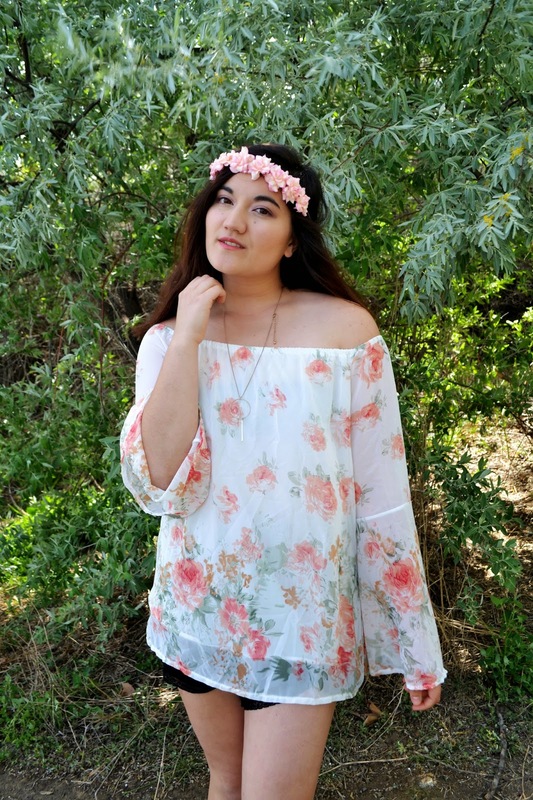 I love how you paired that flower crown with that bohemian top--the look just embodies summer. You've been so busy! I was so pumped to see your post about the 5k and can't wait to read all about it. Also, just a heads up that a I left a comment a few days ago on your life lately post--I'm always afraid people will miss comments I leave on older posts haha. Stay as strong and lovely as ever! You look stunning as always. But like a true goddess in these photos! I have missed you and can't wait to catch up on your life! I also love the over the shoulder look! 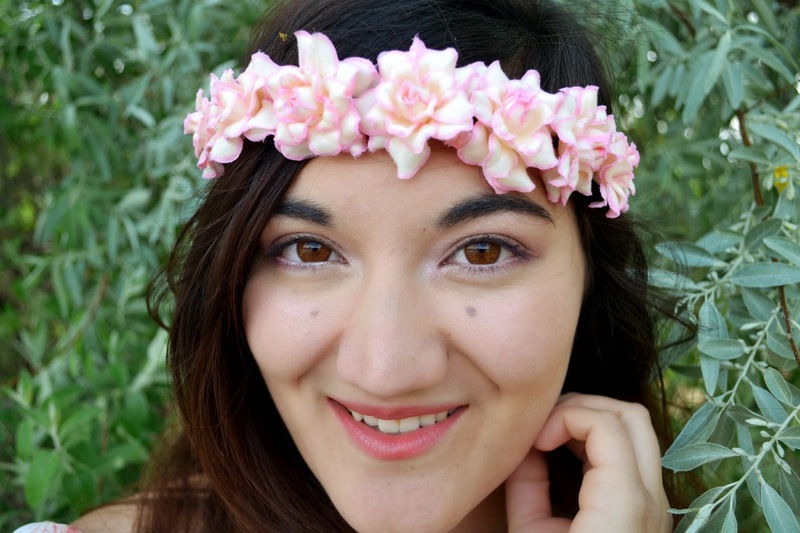 It looks so beautiful on you, especially with the perfect flower crown! You're gorgeous as always! 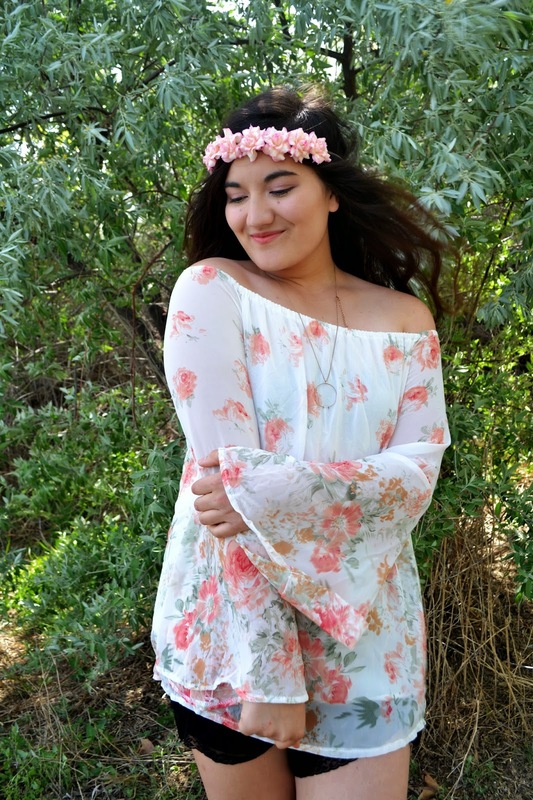 I also just wanted to add that you commented on one of my Looks on Campus for College Fashion-Yesenia! It was really cool to see your comment on one of my posts! So thank you for that haha! Looking good and have a great day! Hahaha, guess I'm not the only one that has been absent from the blogsphere :D Really tiring indeed, the moving part especially, getting sweaty just thinking about it! Love the lenses, so expressive! And you wearing XL? Really? You are quite the hottie, don't see where the man build is at all! The top is on my wishlist for a long, time, I love bare shoulders! so glad to have time to visit your blog again Linda! i've been so busy lately, last semester in uni was crazy! btw, love your summer look here!!! the flower crown adds a nice touch! !